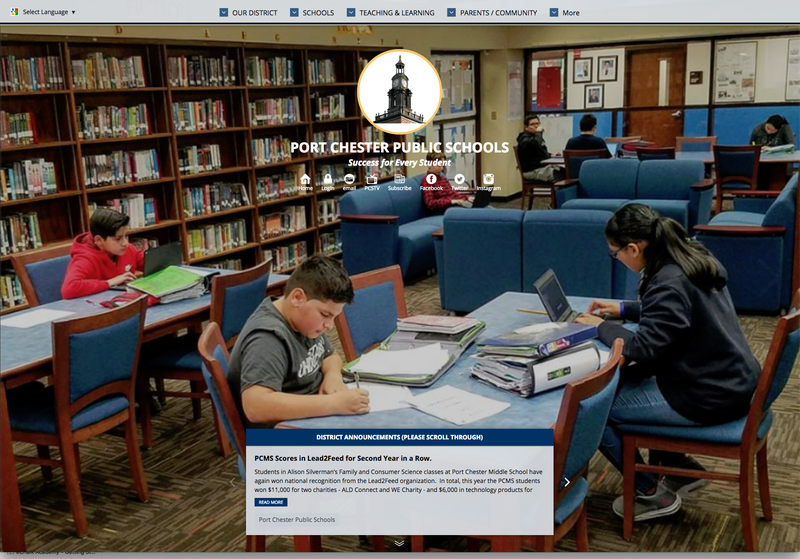 Port Chester makes the most of the visual Brochure theme with an arresting image of their media center. Navigation at the top is simple and intuitive, with links to district resources, individual schools, curriculum, and resources for families and staff. 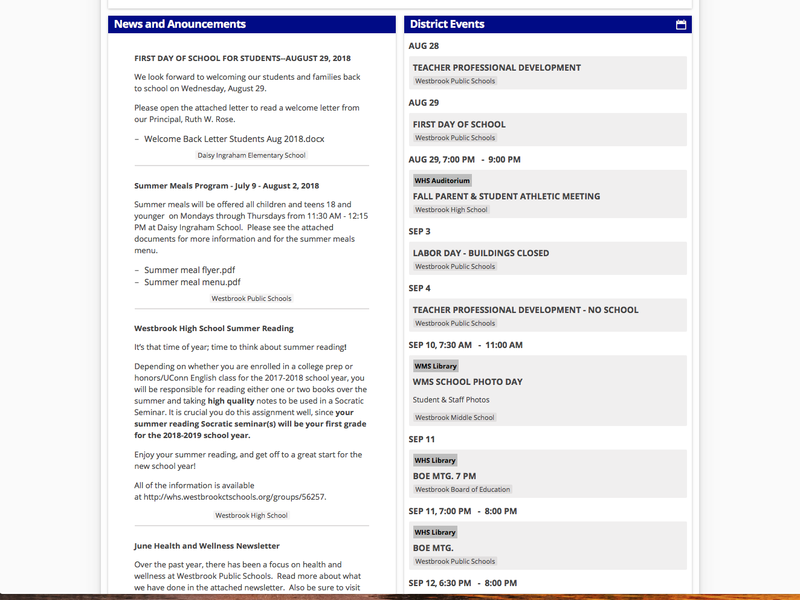 Scrolling down on the home page reveals quick links, news, and other important district information. The banner picture stays in the background behind the content blocks. Individual schools also use the Brochure theme to maintain visual consistency throughout the district. Each school customizes the theme with their own colors and visuals. Navigation is easy here, too, with sections for general school information, curriculum, parent resources, staff resources, and quick links for students. 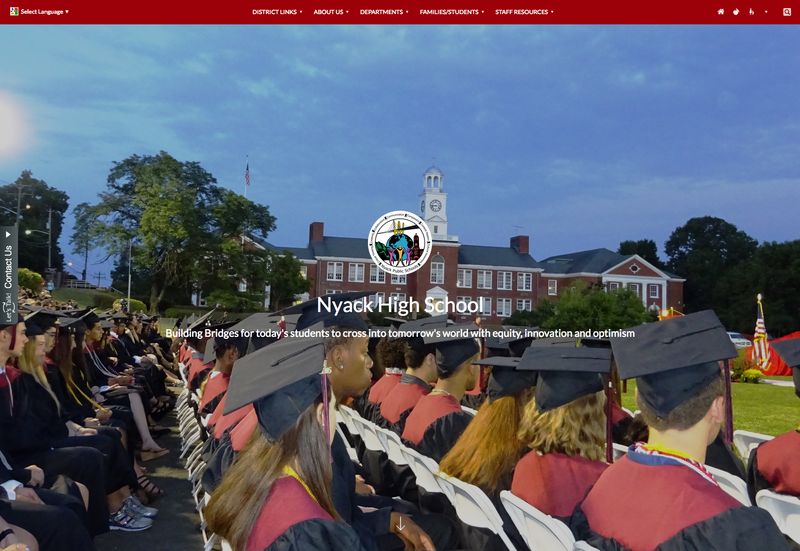 Nyack Public Schools makes great use of the Reprise theme with a rotating carousel of banner images that highlight their students, schools, and local community. 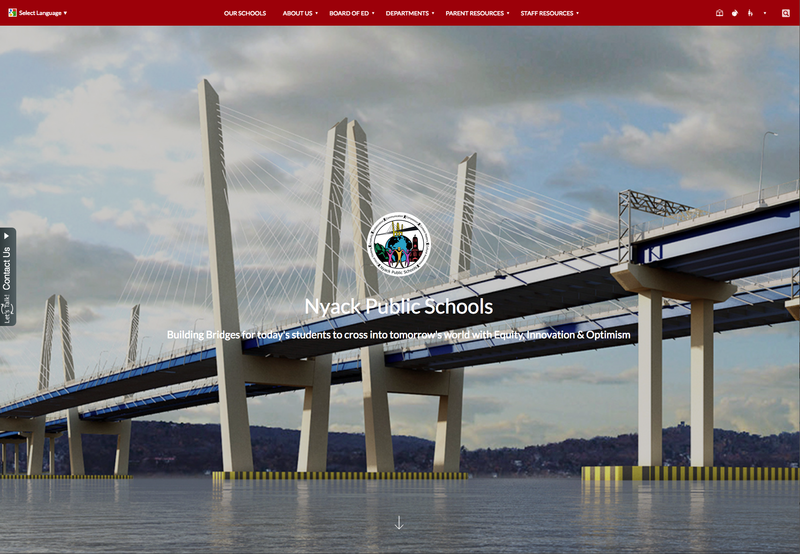 The bridge chosen as the leading image echoes their district motto: "Building bridges for today's students." The school directory makes it easy to find individual schools in the district. 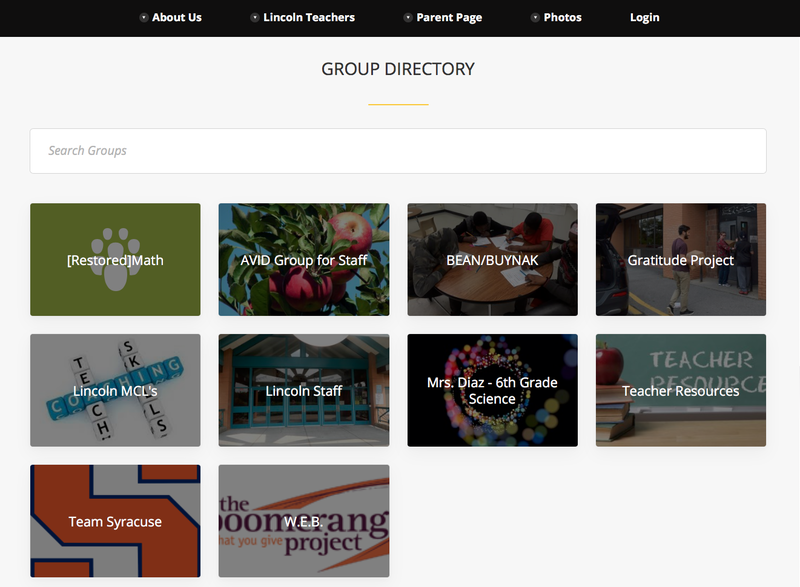 Pictures of the schools make the directory more visually appealing. Individual schools also use the Reprise theme for visual consistency. Each school has its own rotating carousel of images highlighting their students and special activities. Students and parents can find all of the latest updates on their school teams on the Athletics page. The large picture carousel at the top has highlight pictures from recent games. Oysterponds Union Free School District uses rotating images of their students and community in the banner of their homepage. Using bright, colorful images takes full advantage of the visual Reprise theme. The School Board page has links to meeting notes, information about upcoming board meetings, and other important information. Having a dedicated landing page for Board news keeps everything organized and makes it easy to meet reporting requirements. The Shelton Public Schools home page includes a video message from the superintendent, upcoming news and events, and quick links to the resources families need the most. Using one bright color with a soft neutral gray secondary color makes this Marquis site look inviting and professional. Banner alerts draw attention to time-critical information. Alerts can be pushed down from the district to all school sites. Clicking on the banner alert brings up a pop-up with more information. 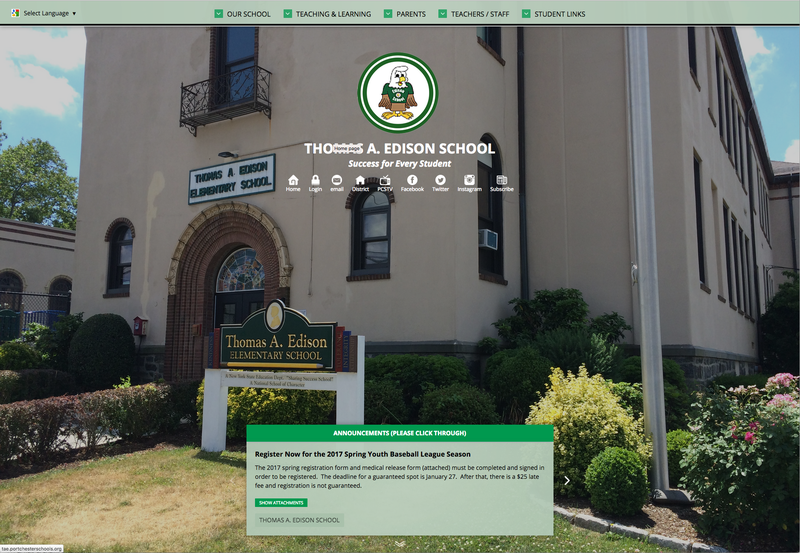 Individual schools also use the Marquis theme and maintain consistent colors and navigation. The Quick Links and District News blocks link directly to the district site, so updates automatically appear across all school sites. This unified calendar pulls information from both the school and district calendars so busy families can see everything in one place. The William Cullen Bryant home page uses the Marquee theme. Their simple use of color gives the site a clean, appealing look. The top navigation is well organized to make everything easy to find. 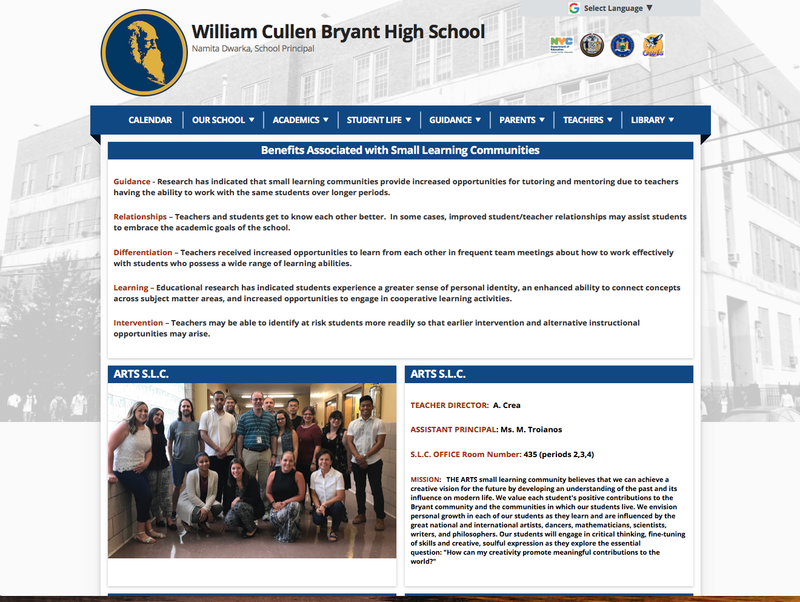 William Cullen Bryant is organized into Small Learning Communities (SLCs). This page highlights each SLC with important information and their unique mission. The Google Translate tool allows website visitors to translate the entire site into their native language. Website translation helps them serve everyone in their community. 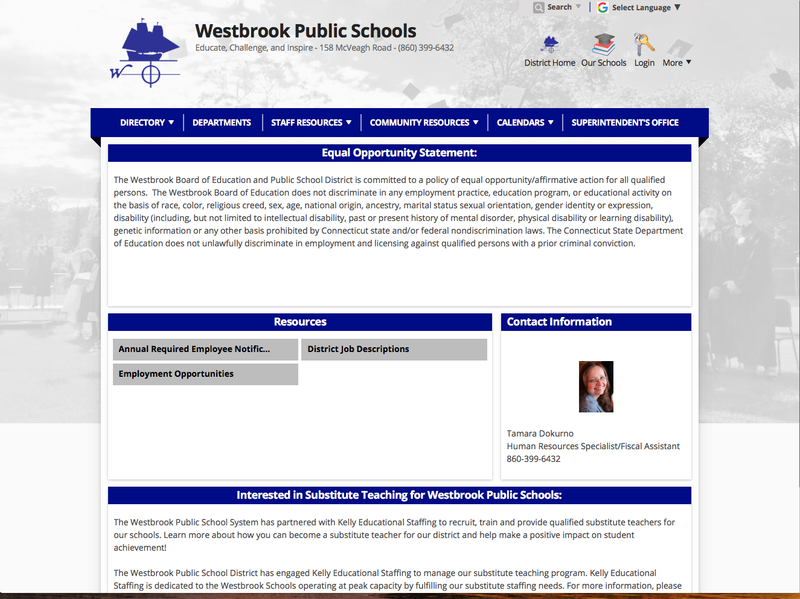 Royal blue, white and grey give this district website a clean, simple look. 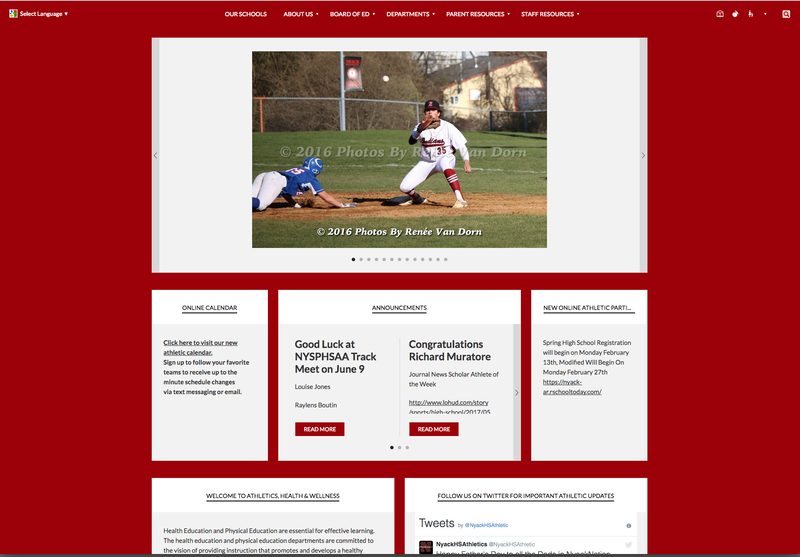 The website is anchored by a large photo celebrating their students. Scrolling down on the home page, visitors will find important news, announcements, and events. The two-column page layout works well here. Westbrook uses eChalk Groups to organize their departments. Each department has a group, which allows them to control their own public webpage, news feed, and calendar. The Human Resources webpage has important announcements and resources for staff, along with information about working for the district. Each academic department has their own group and public webpage. They use their webpages to share curriculum resources for Elementary, Middle School, and High School. Bright green, gray and white give this page a clean, professional feel. The News theme lets Drew highlight important content. Drew has selected pictures that pick up or complement the theme colors. The use of the green overlays on the pictures give the page a pulled-together look and allow the pictures to be used as navigation elements. Pages for departments and programs help Drew showcase its strengths for prospective families and staff. The staff directory makes it easy for parents to find teachers and other staff members. Island Park puts important information front-and-center with this bold use of the Mosaic theme. 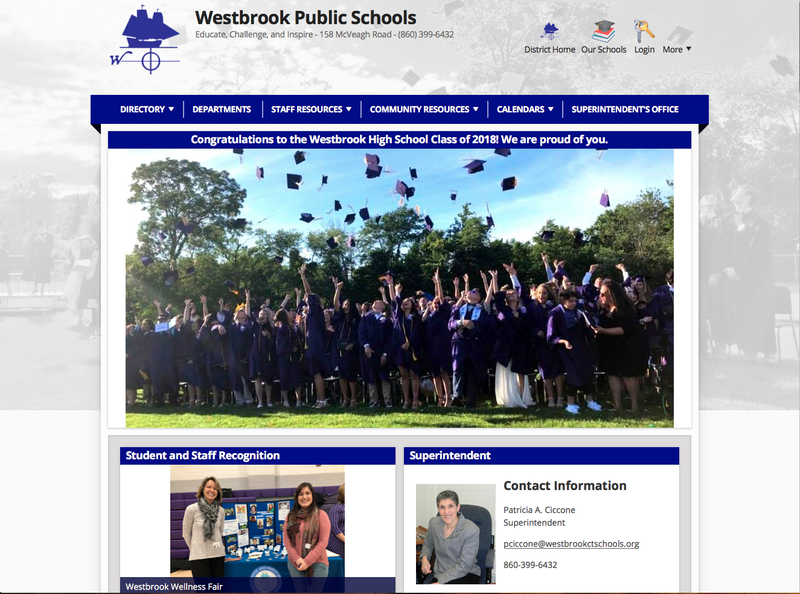 The home page features the information parents look for most often, including news, quick links, the district calendar, school lunch and payment information, and even a local weather app. 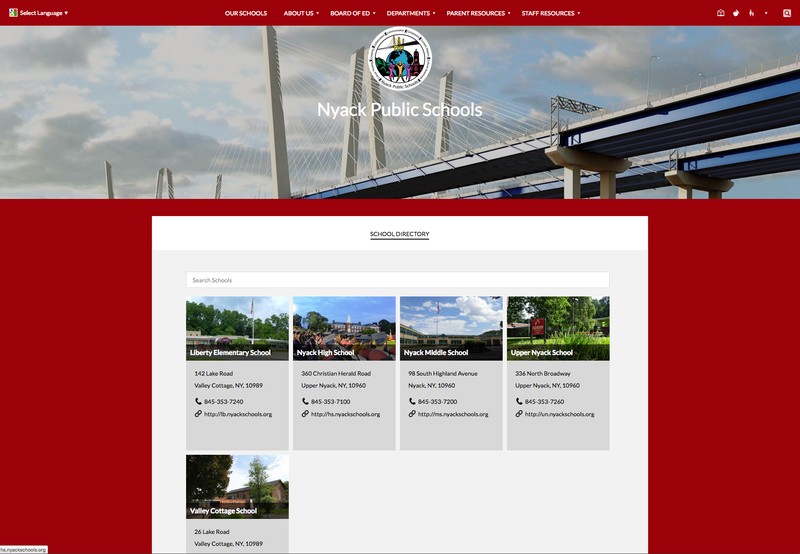 The side navigation makes it easy to find additional information and resources and toggle between the district and school websites. The Mosaic theme and district colors are carried through to the individual school websites. This continuity makes it easy for parents to locate information on the different sites and provides a sense of unity among the schools. Lincoln Oren Middle School makes great use of Teacher Pages. Teachers use their pages to keep parents and students up-to-date with important class information, calendars, and assignments. 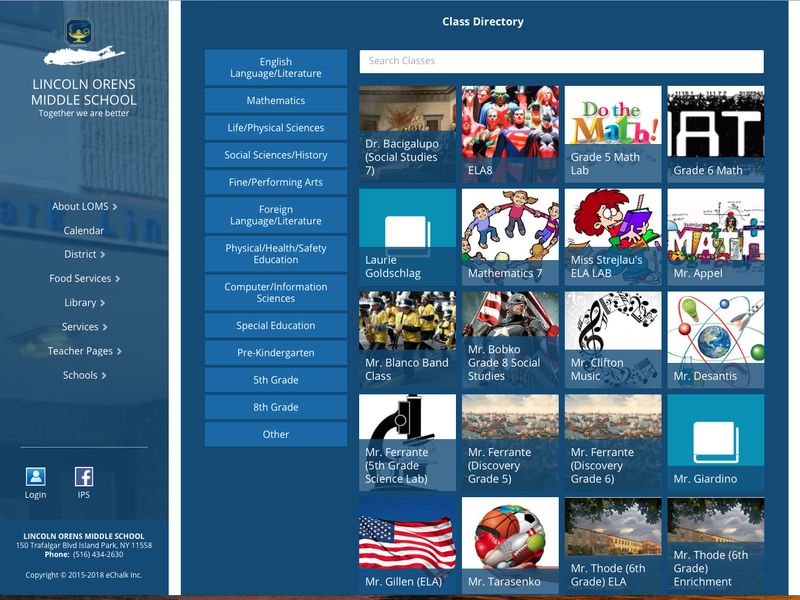 Parents can find all of their children's teachers in the auto-generated Class Directory. The Southwest Board of Cooperative Educational Services (SWBOCES) Center for Adult and Community Services uses their website to showcase their services for local school districts and community members. The muted gray and green color palette and larger blocks are sophisticated and easy to read. The center uses a rotating picture carousel in the top row to highlight the different vocational areas they support. Potential students can browse available courses on pages for each career track. The Mosaic theme highlights all of the healthcare options very nicely on this page. Using a simple grid for the page layout makes it easy to quickly browse through the available courses, while the alternating colors add visual interest. Pawling Central S.D. makes great use of the Prestige theme with a rotating carousel of high-impact images. The pictures they have chosen complement their bold orange and charcoal theme colors. Scrolling down the home page reveals announcements, upcoming events, social media feeds and a picture carousel highlighting recent events. The navigation bar (which starts at the bottom of the page below the banner) now remains at the top as you continue to scroll. The white background keeps the look clean and simple, and lets the colors in the menu bar and their photos really pop. 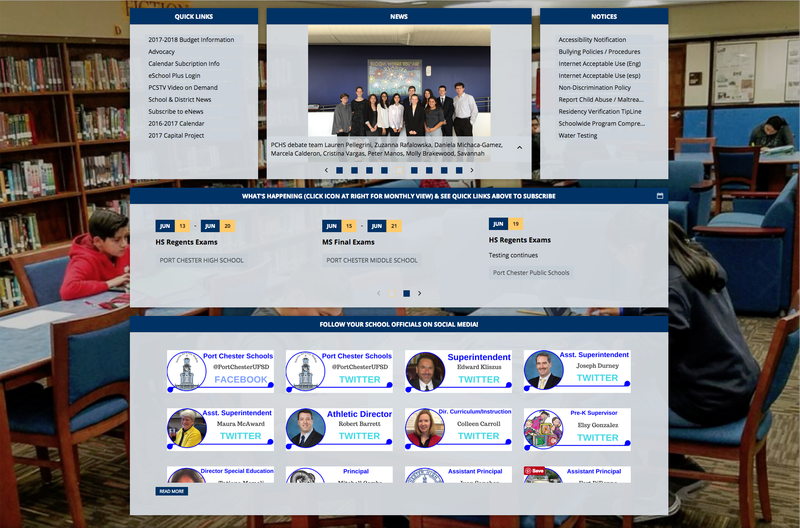 Schools within the district also use the Prestige theme and district colors, providing a unified look and feel across all of the websites. 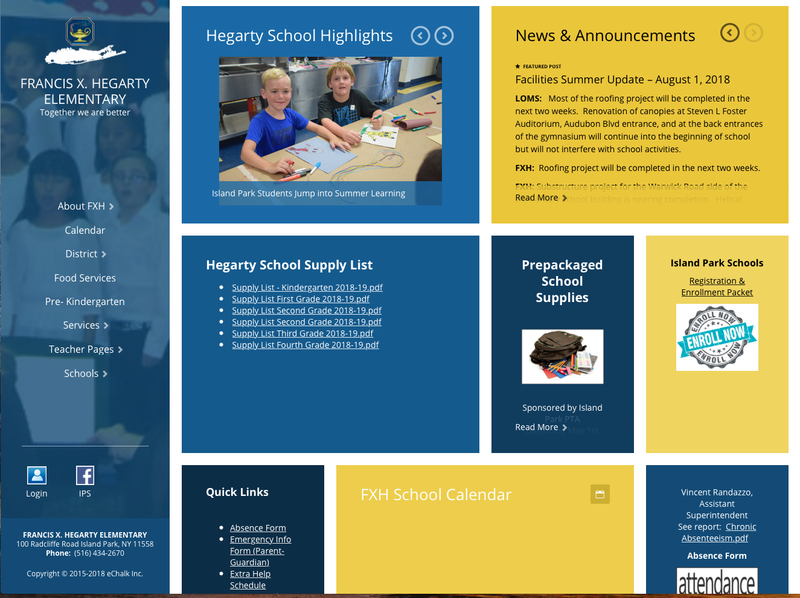 Schools personalize their pages with their own news feed, pictures and calendars. The navigation is simple and intuitive, providing easy access to everything with minimal clicks. Here, they have organized important information for parents. The Lower Hudson Regional Information Center (LHRIC) Instructional Technology center uses cool blues and crisp white to give their page a calm and professional feel. The information bar above the navigation includes a call to action: you can click to schedule a tour! Their social media links are embedded right into the banner below their name. Scrolling down on their home page reveals announcements, a photo gallery, quick links, events and social media feeds. The navigation bar now remains at the top of the browser window as you scroll down. 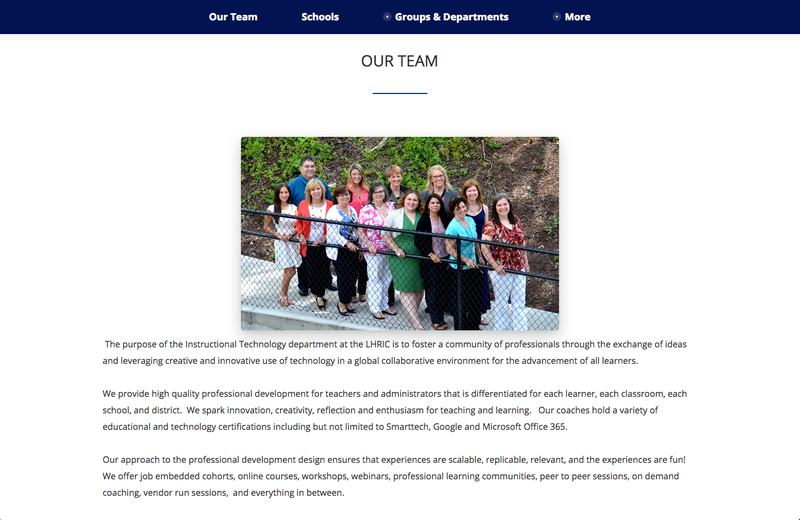 The "Our Team" page highlights the skills of their team and the services that they offer to LHRIC districts. The team photo adds a personal touch. Groups and departments have their own pages. These pages allow groups to share more specific news and events for their members. Bold use of gold and black make this website inviting and fun. A rotating carousel of eye-catching pictures makes good use of the Prestige theme. A little further down the home page, website visitors can find upcoming events, the news feed, and social media feeds. 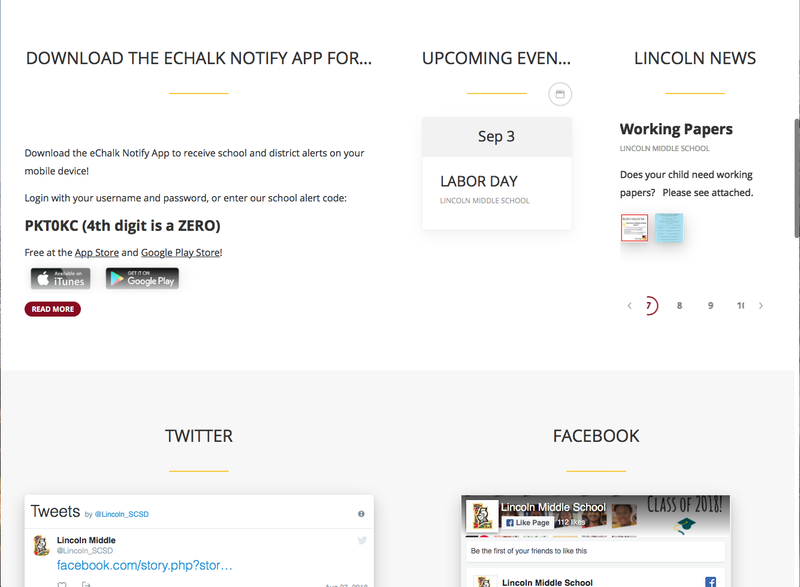 They also have put instructions and links for downloading the eChalk Notify app! Lincoln supports its teachers with faculty groups. Groups provide both public websites and private, logged-in spaces for faculty to connect. The Parent Resource Page pulls together information and resources for middle school parents, including school policies and links to programs. The Google Translate tool allows visitors to translate the entire website into their own language. The best way to understand how eChalk works is to try it.